What more says “Muskoka” than a pair of Muskoka chairs watching a sunset? I know my American friends call them Adirondack chairs but I think we had them first 🙂 When Sue at Thimbles&Things saw the first design she knew she had to have that block to celebrate her daughter’s new business, Fireside Retreat. 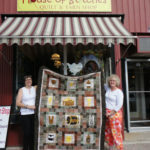 It’s a gorgeous old stone home, lovingly restored, and a great place to get a group together and quilt. She has some nicely painted- yes red and yellow- chairs on the beautiful big deck. I hope to retreat there sometime soon! In the meantime, I will sit in my big plastic version of the chair (sacrilege I know), with a glass of wine, in my pretty little yard, squint at the trees and pretend. The grand prize for the hop is some time at this lovely retreat-check it out at any of the participating shops! Leave a Reply to Vera Stewart Click here to cancel reply.